The last product from the Note range was a disaster, but that didn’t dissuade Samsung from continuing to move forward: the Note 8 will be launched very soon. I can’t wait to see it, and to be honest, I’ll probably buy it. Here's why. This story dates back to the year 2011, when the first Note was available on the market. I was lucky enough to own one, and I have to say I had a bit of a weak spot for this device. This first Note was only 5.3 inches big and In 2011, this seemed enormous. Of course, the S-Pen was already part of the package, and even though we were skeptical at first, we got used to it pretty quickly. It’s quite a subjective opinion, but I must say after using an array of other smartphones from many different brands, I still maintain a preference for the Note range, and it’s time for me to throw myself back into it. When the Galaxy Note 7 was released, I was already considering going back to the good old Note series. The device seemed perfect on all counts; the design was magnificent, it had a wide screen, it even had iris scanning technology… In short, everything about it was exquisite. I tried not to succumb to my desires and wait a little longer before purchasing the device, as you never know. We all know what happened next: boom! I still remember thinking “Samsung will solve the problem, and then I can buy it”, but more and more cases of exploding phones were quickly emerging. Then... silence. 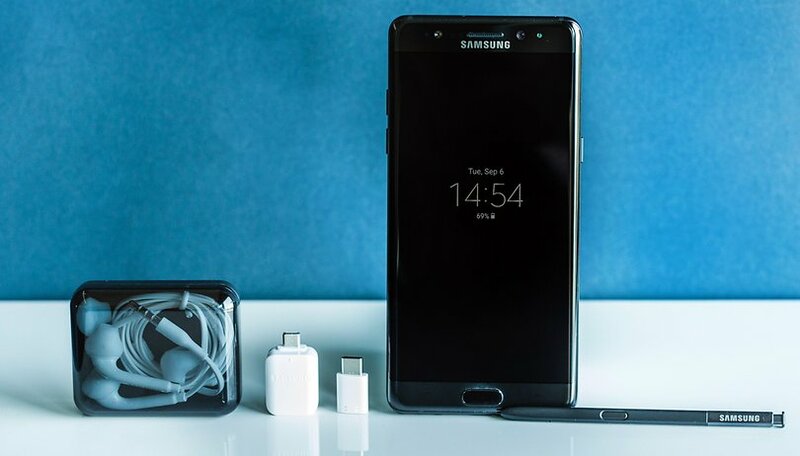 The Note 7 disappeared as fast as my hopes of buying it. A little disappointed by the whole situation, but especially by Samsung’s lack of reliability, I bought another phone. However, the water’s now under the bridge and I intend to catch up with the next release. This one will, without a doubt, be just as beautiful and powerful. Let's just hope it won’t explode this time. Like its smaller cousins, the Galaxy S8 and S8+, the Galaxy Note 8 will benefit from a large, bezel-less display. According to the rumors, it’ll have a 6.3-inch Super AMOLED display (classic from Samsung), with a resolution of 1440 x 2960. Samsung christened this type of display “infinity”, because the screen edges appear to be limitless. I understand that this type of display isn't for everyone, and that it can cause problems for developers who have to adapt their apps to fit the screen, but for multimedia fans like myself, it’s a real treat to use. Watching videos on a smartphone of such a size is a real pleasure (we experienced it with the S8/S8+ and the LG G6). So although it may not be to everyone’s liking, it is to mine. The theme of software interfaces is usually a bit difficult to discuss, as opinions are divided. A few years ago, Samsung’s interface wasn’t particularly pretty, but it wasn't ugly either. You get used to it, and the quality of the device quickly makes you forget about it, but ultimately we’re very happy to see how much TouchWiz has evolved. Samsung has done away with colors that don’t match, now there are nice shades of blue, white, and black that give it a suave appearance. In addition, TouchWiz has improved a lot compared to what it used to be, so I have no apprehension regarding the system as I do with other competitors. Are you a fan of the Note range too? Do you plan on purchasing this device? Let us know your thoughts in the comments below. Here's why not to get excited. I can't get excited about this phone. I don't like the glass back. I don't think the curved screen does anything good to the ergonomics. Speaking of which, the fingerprint sensor seems placed to spite the users. I don't particularly like their stuttery software. I hate the app duplication - Google's are way better. Samsung's are unnecessary and mediocre. I see no need for Bixby whatsoever, together with its dedicated hardware button and dedicated in-camera-app button. It would annoy me to no end. I'm looking at the Essential and the Mate 10. The chance of buying a Note 8 is nearly zero. Well then. I'll just wait awhile til I really need to upgrade my phone & go for an S8, instead of the Note8. The S-Pen and secondary camera don't interest me at all, increased memory perhaps but that's not enough in itself. The man protests too much, clearly you want one. Price is a huge factor. Size of the phone is another. With the note 8 both will make me probably not consider it. The Note is unique. It is geared toward a specific audience and it will sells millions. if the phone is gana be the big and tht expensive make it Indestructible PLS give us a break ! I have an S8+ which I really like but I just can't get excited about the Note 8. The Note series was always bigger than the other phones but this time round it seems to be basically the same as the S8+ but the screen is 0.1 inches bigger and it comes with a pen to draw on the screen. If you aren't bothered about the pen then just get the S8+ and save yourself some money. Nowadays there are so many mid range price smartphone that has great performance too, some even almost ON-PAR with those so called luxury phone like S8+ or Iphone 7plus in terms of performance and built-in quality, and yet the prices is almost HALF of those luxury phones. To list one here, and that will certainly goes to "ONE PLUS 3T". OP3 is nothing like the S8. The Note is geared to a specific audience like me. Sounds like the ZTE line. I think the phone market is going to move away from flagships. They're becoming overpriced for the value they deliver. Just as car enthusiasts read about high end performance cars but own and drive Hondas, so it is here. There are phones costing hundreds less that come close in performance and weather daily use better. These kinds of phones as nice as they are are becoming impractical for common ownership. Doesn't matter what the price. The true note fan Will line up from here to timbuctoo for the note8! I can tell it's been awhile since you've used a Galaxy. Actually I use my Galaxy Alpha every time I travel (which is often), so I constantly get reminded of both Samsung's poor software, poor Bluetooth implementation (awfully weak signal that cannot keep a connection to my watch when the phone is in my pocket, sent it back to Samsung with the Bluetooth specification and they replaced the board, works exactly the same as before) and exceptionally poor software update policy. As for newer models, xda is full of accounts of S7s and S8s stuttering and people complaining about bloatware. At least with Huawei you get little pre-installed bloatware and you can remove absolutely everything with the normal uninstall procedure. The chance of buying the Note 8 is nearly 0. Uh oh. I like Google. I'm getting motivated now to not wanting to ever get a Note 8. Although I think I might like a Note 8, I will proceed with caution. My original (years ago) decision to go with Android instead of Apple was the removable battery. Samsung's choice to drop that feature has taken that major feature away from my calculations. I have big hands, I like big phones, I also like the precision that a stylus enables for my fat fingers. Therefore, I will look at the Note but wait a while before purchasing. My fingers are small but clumsy & I love the idea of having a stylus. 2016 called and want's its lame joke back! I wish they would continue to develop a phone option that is smaller. I have an ancient Galaxy 3 because I don't want to carry around a tablet sized phone all of the time. All of the bells and whistles are fine for those who want that but there are many of us that just want to have a reasonably sized phone with the ability to do a few things on the web like check email, get gps etc. Are they going to provide such a product for those of us with that need? You should look at the LG G5. It is what I replaced my aging S3 although a little bigger it is not giant and the removable battery make it a real winner. Despite all the bad wrap the phone got it is a great phone. I hear ya but tht big and only glass man I can see crack shatter bang it's a rap ! I haven't dropped my ZTE yet!! Oops & I don't have a case for it yet either!! 7) Duplicated software and (for some) carrier bloat that leads to.. Whether we like the large display or not I predict the note8 is gonna sell like hot cakes no matter what the price. Samsung has just about perfected the Amoled Display. There is no finer. Consumer's have waited along time for this particular note & the s-pen. Many fans are very anxious that's for sure! I'm looking forward to seeing one of those.